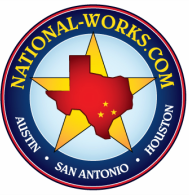 National Works, Inc. is a sewer service company specializing in no-dig technologies and the premier Texas applicator for Sewpercoat. No matter your sewer needs, NWI is here for you! Whether you need cleaning and televising, new manholes coated or an old lift station rehabilitated, we are here to fulfill all your sewer needs. Quality work and exceptional service are the pillars upon which National Works, Inc. is founded. Led under the experienced direction of Greg Seely, this family owned and operated business takes care of our customers and all of their sewer needs. Contact NWI at 830-875-2770 for project estimates and scheduling.